Kentucky has been a hot-bed for Bigfoot activity lately. So the timing of this Bigfoot event couldn't have been more perfect. This event was held on February 20, 2016 in Jenkins, Kentucky. The event was put on by Bigfoot researchers, Charlie Raymond and Thomas Marcum. 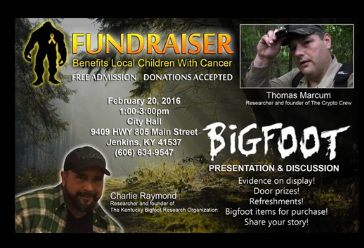 Charlie is the founder of the Kentucky Bigfoot Research Organization (KBRO), and Thomas is the founder of The Crypto Crew. So you know you're in good hands at this conference. Here is a slideshow that Thomas put together of the event that just took place.